Click here to see the funded projects. HBHL’s implementation framework consists of a suite of initiatives designed to stimulate, accelerate, and integrate progress across the research program with a focus on interdisciplinarity across fields linked by neuroinformatics. This framework combines: (i) exceptional trainees; (ii) outstanding researchers; and (iii) world-class research infrastructure, with knowledge translation agility and wide outreach. The design of HBHL supports a research enterprise that can move farther, faster, and more assuredly toward its goals than the 20th century academic model. Program elements: The innovative program elements presented above span four domains: Research, Talent, Innovation, and Research Infrastructure. For each area, we have: (i) identified a set of key objectives in the discovery-to-innovation continuum; and (ii) designed the specific programs or tools necessary to achieve these objectives. These programs and tools are not widely available across conventional funding programs in Canada. Some of these programs have been prototyped at McGill, while others have been modelled after successful programs used elsewhere. Program structure: CFREF funding will be allocated based on peer-review mechanisms. A Research Management Committee is responsible for transparent resource allocation, including calls for proposals, peer review, progress tracking of projects, and program performance evaluation. 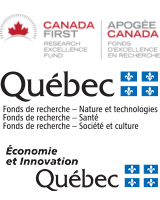 Some programs will be delivered jointly with partners, such as Western’s BrainsCAN, Université de Montréal's IVADO and CIFAR.